The 2017 LDA Conference in Baltimore, February 16-19 is going to feature a special event Saturday, February 18. In addition to other outstanding speakers and sessions on that day, there will be a well-chosen selection of sessions that will make up a focus strand for parents. 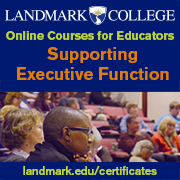 These sessions are designed to give support to parents who are trying to gain a better understanding of their child’s learning disabilities and at the same time are struggling to figure out how to get the best possible special education services and the best education in the general education classroom for their children. Information from these sessions may prove to be not only informative and supportive but also life changing. I know what it’s like because It doesn’t seem very long ago that my husband and I were parents of four young children, trying to understand why our oldest son in first grade was struggling with reading, math, spelling and written language. At the end of first grade, his teacher told us that next year in second grade, a new program for students with learning disabilities was going to be available for students like our son. That was the first time I had heard the term learning disabilities and I didn’t have a clue what learning disabilities were, but if this program could help him learn then it was OK with us. For the next four years, two to three hours a day, he was in a pull-out resource room program for students with learning disabilities. He not only learned how to read but he learned to read very well. He became an exceptional reader. We were thrilled. By sixth grade we thought he was cured, so he exited the program. The next two years went quickly and soon it was time for high school – that was the wake-up call for us. Grades in high school play an important role in determining what the student does after graduation, be it a job, community college, technical training or a four- year college. In classes like English or History, his reading and writing skills served him well but in math, spelling, science or foreign language he barely reached passing grades. So what was wrong? Since he could read we knew he didn’t have dyslexia, therefore, he didn’t have a Learning Disability, because in our minds Dyslexia and Specific Learning Disability meant the same thing. What we didn’t know is that the term Specific Learning Disability is an umbrella term and covers many different types of learning disabilities such as: Dyslexia – a disorder in reading, Dysgraphia – a disorder in written language, Dyscalculia – a disorder in mathematics, and other cognitive (thinking/neurological) disorders such as short and long-term memory, organizational skills, visual sequencing, auditory processing and executive function. At that time, special education services in high school were difficult to come by. We didn’t have him re-enter special education and tutors became an important part of both his life and our lives. When our oldest son was in high school our youngest son was in fourth grade and having problems with organizational skills (he couldn’t copy onto paper his assignments written on the blackboard), math computation (he understood math concepts but couldn’t line up the numbers so the answer was often wrong, however, he could look at the problem and usually arrive at the correct answer), writing a short story (that was a team effort where he would dictate to his father and I and we wrote it down) and yes, spelling was a big problem too. We thought he could read but later found out he was guessing at many of the words – sometimes correctly but as reading assignments grew more complex, more often his guessing was incorrect. We had many teacher conferences trying to figure out what was wrong and why he was struggling to learn and we kept coming back to the thought; perhaps he has learning disabilities. But that didn’t make sense to us because his learning problems weren’t the same as his brother’s. Since there were no easy answers, we had him evaluated and the evaluation which included a cognitive assessment showed pronounced strengths and weaknesses. Yes, he certainly did have learning disabilities! That’s when we learned that all forms of learning disabilities aren’t alike – learning abilities and disabilities are unique to each person. AND that’s when I joined and became active in the Learning Disabilities Association (LDA), an important and meaningful decision that helped to shape the lives of our children. By joining LDA I met other parents whose children had similar learning problems and learned about the broad spectrum of learning disabilities and what they are. I also learned about state and federal special education rules and policies (a whole different set of policies from general education), learned how to work with the special education teachers to write an Individualized Education Program (IEP) and learned how to advocate for children so they would receive an individualized education according to their special needs as written in the IEP. We also learned that, in general, most federal and state legislators and policy-makers don’t understand special education and the needs of children and adults with learning disabilities. So it is up to us to tell the story of our children and to create an understanding of the condition of learning disabilities and how our children CAN LEARN when taught by knowledgeable special educations teachers and general education teachers who will follow the student’s IEP and support the student in using accommodations in the classroom and in testing situations. If you know of parents who might benefit from attending the LDA Conference in Baltimore, please pass this article along to them. We have lived the life and have learned a lot along the way. We are here to give support to parents and professionals and to all who are interested in learning more about Specific Learning Disabilities, learning disorders and learning differences. 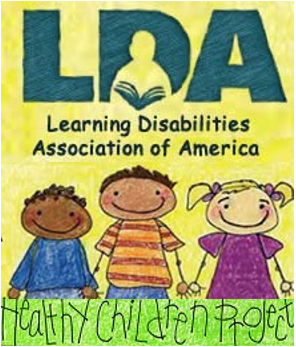 LDAAmerica.org: For information about the Learning Disabilities Association, an LDA Affiliate in your state, the LDA Conference or articles and information on learning disabilities. 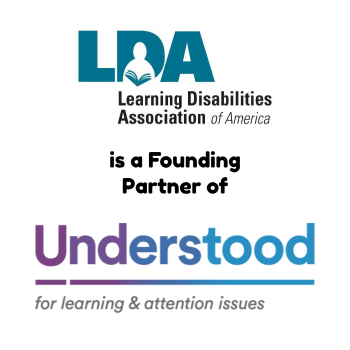 Understood.org: A website for parents with articles and information on learning disabilities. You did a great job of explaining learning disabilities! Know you will be a great president. Texas will be pulling for you.